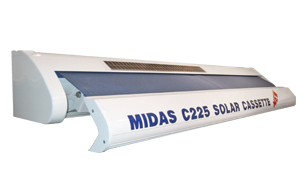 The innovative Midas C225 Solar Cassette has an inbuilt mono crystalline 5 WP - 18v solar panel in the roof of the cassette which directly charges into the Lithium Battery 4AH -12v DC which is also concealed within the cassette. 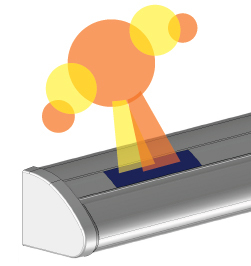 The battery when fully charged by natural light (direct sunlight of course being the ultimate) will perform 60 direction movements for a 6m x 3m awning. The battery is fully charged before installation but also comes complete with a manual override and a charger should a quick top up be required. We recognise that other solar powered cassette awnings are available but to date we have yet to see other systems where the panel and battery are actually housed in the cassette itself creating such beautiful clean lines. The Midas 225 comes as standard white powder coated Ral 9010. Other Ral colours are available on request.